Brood: Young larvae that are capped with beeswax and will emerge as adult bees. Brood chamber: The main part of the hive where the colony lives and the queen lays eggs and the bees store honey for winter. Capping: A thin layer of wax covering cells. Colony: A cluster of worker bees, drones, and a queen. Drawn comb: Completed wax cells that are ready to be filled. Hive: Box or boxes where the bees live. Propolis: Resins and gums gathered from trees that the bees use to seal cracks or make repairs. Queen: The mother of the hive. 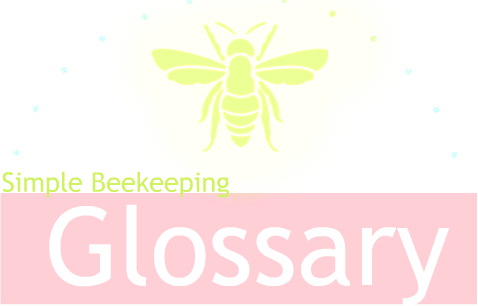 Worker: The female bees who tend to the business of the hive and forage for food. Tomorrow we'll cover the pieces of equipment and tools. And later pests and other problems. There will be new words for those too, but these are the absolute basics. Knowing these terms will make the rest of the series much easier to understand.